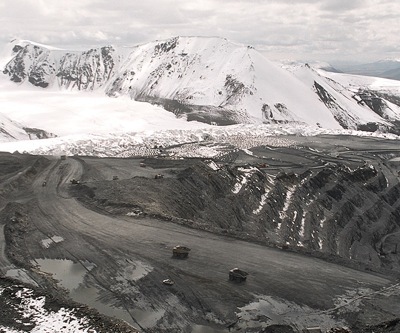 The long-dragged negotiations between Canadian miner Centerra Gold (TSX:CG) and Kyrgyz authorities about the future of the company’s flagship Kumtor mine, may finally be headed for the home stretch, as the parties reached Monday a memorandum of understanding. In the non-binding pact, the Toronto-based firm agrees to review a proposal that would give the Central Asian country a 50% stake in Centerra’s gold mine, tucked high in the Tien Shan mountains. The agreement would allow the state-controlled Kyrgyzaltyn JSC to exchange its 33% stake in Centerra for a 50% interest in a joint venture that would own Kumtor. The Canadian miner would remain the operator and manager of the mine, and would also receive $100 million, the firm said in a press release. The gold company has been under pressure to rework a 2009 contract to operate the Kumtor for over a year, during which has faced massive protests from locals demanding the mine’s nationalization and more social benefits. The Canadian miner is a significant employer and taxpayer in the country and a key contributor to the Kyrgyz economy. In fact, the Kumtor open pit gold mine accounts for 60% of the nation's industrial output and, according to the company, it is the largest gold mine operated in Central Asia by a Western-based company. The Kumtor mine output is expected to almost double this year to as much as 600,000 ounces, according to Centerra.